Tegeler Audio's Crème buss compressor and mastering equalizer is now available with a new design. Moog announced that they are discontinuing the Moogerfooger MF-105M MIDI Murf and MF-107 Freq Box. 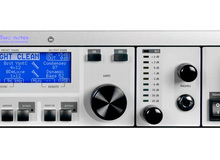 Radial introduces Decoder, a Mid/Side interface that allows for creating a stereo image from multiple microphones. SM Pro Audio announces the availability of the JuiceRack 1, a new power source for 500 Series modules. Thermionic Culture celebrates its 15th anniversary and launches for the occasion a new version of two classic units. Radial Engineering announces the ChainDrive 1x4 distro and line driver, the latest in the company's range of 500 series modules. Radial Engineering introduces the Tossover, a 500 series module that lets you to divide the frequency bands of an audio signal. MaximalSound.com has introduced various new features. Unit Audio announces its Unit 16 x 2 passive summing mixer.